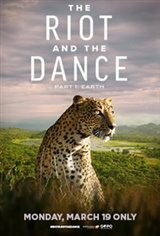 Fathom Events and Gorilla Poet Productions present Riot and the Dance, a cinematic celebration of creation in movie theaters nationwide for one night on March 19, 2018. This nature/science documentary showcases the vast and beautifully intricate planet on which we live. The film presents a wide variety of ingeniously designed creatures from around the world in a way that will fascinate audiences of any age. Through a vividly powerful experience, the audience is intended to develop a greater understanding of and appreciation for the Creator's workmanship and personality. Dr. Gordon Wilson will host well-known scientists and experts to open eyes to the glory of creation.